作者: The AsiaN Editor on 19 September , 2018. North Korean leader Kim Jong-un made a surprise announcement Wednesday that he will visit Seoul soon. The announcement came at a joint press conference on day two of his summit with South Korean President Moon Jae-in that also included the signing of a peace deal and a further commitment to a nuclear-free Korean Peninsula. “I promised South Korean President Moon Jae-in to visit Seoul in the near future this year,” Kim said. The two leaders held the press conference at North Korea’s state guesthouse Paekhwawon, where they agreed on the Pyongyang Peace Agreement. “We have agreed to make the Korean Peninsula free from fears of war,” Moon said. 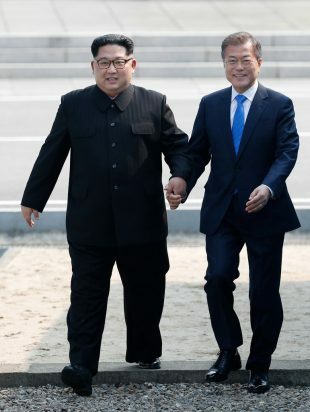 Kim said “today’s Pyongyang deal will lift inter-Korean ties to a new level,” and the latest summit “will advance the era of peace and prosperity.” The two leaders reaffirmed their commitment to “active efforts for a nuclear-free, peaceful Korea.” “We agreed to remove all sources of conflict from the Korean Peninsula,” Moon said. “And we have agreed to specific denuclearization steps for the first time. Nuclear-free Korea is not far away.” The “steps” included, according to Moon, the permanent shutdown of nuclear facilities in Yongbyon as well as the Dongchang-ri missile test site and launch pad. Their non-military agreements included reconnecting cross-border railways and roads before year’s end, and resuming inter-Korean projects – the Gaeseong Industrial Complex and Mount Geumgang tours – if conditions are met, Moon said. The two also agreed to open permanent family reunion facilities at an early date. Before the press conference, the leaders signed a comprehensive agreement on military tension reduction as a result of their third bilateral summit. Military top brass from the two Koreas, South Korean defense minister Song Young-moo and his North Korean counterpart No Kwang-chol, also signed the agreement and exchanged the documents. The leaders started the second round of formal talks at Paekhwawon at 10 a.m. Wednesday, seeking to establish lasting peace on the Korean Peninsula. Moon and his wife Kim Jung-sook spent the first night of their three-day visit at the guesthouse. Unlike the first round of talks the previous day, the latest meeting involved only the two leaders. On Tuesday, Kim thanked Moon for brokering his summit with U.S. President Donald Trump in June and expressed hope for further progress in the nuclear talks with the United States. “I feel the great weight we must bear, along with a heavy responsibility. I wish this will be a summit that produces abundant results as a gift to the 80 million people of this nation for Chuseok,” Moon said, referring to the upcoming holiday that falls on Monday.